Presenter Audrey Carville, in an interview with Fianna Fáil leader Micheál Martin, asked him about the front page story in today’s Irish Independent, headlined: “FF deal with Leo will quieten Left parties in Dáil’. 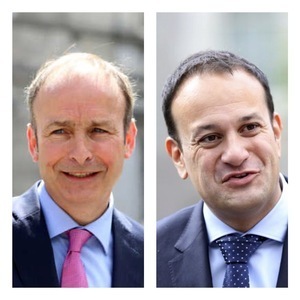 In a shift away from so-called ‘new politics’, Michéal Martin wants to team up with incoming Taoiseach Leo Varadkar to rebalance power in the Dáil to reflect the number of TDs in a party. 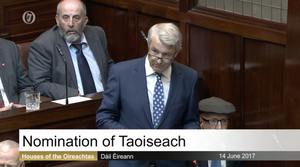 ….During his meeting with Mr Varadkar, the Fianna Fáil leader argued that the d’Hondt system should be used for deciding speaking time. This would see time allocated based on the size of a party’s representation. “I think Leo understood where I was coming from very strongly on that,” he said. 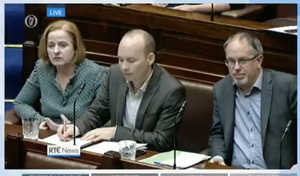 Posted in Misc and tagged Dail, left, Leo Varadkar, Micheál Martin, speaking time at 11:16 am on June 13, 2017 by Broadsheet. Speaking time proposal makes sense. 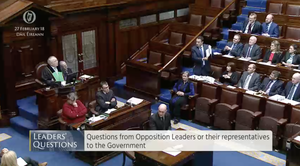 Mick Wallace gets about as much speaking time as the entire FF backbench. Not exactly fair. Who wants to hear from the FF back bench? Unless they’re apologising for leaving the country bankrupt, being run by the Troika and funded by the short term, emergency USC of course. Of course FF and FG are teaming up again. Of course they’re trying to silence the left wing of the house. Of course they are proving themselves to be, again, unscrupulous, undemocratic scam artists. Of course the bootlickers will justify it. Hey Bodger, why are you driving traffic to / doing PR for RTE? RTE should be shut down – a pile of overpaid Labour/Sinn Fein luvvies with trimmings of FF around the edge. We have enough state propaganda from the Irish Times, Independent, and the rest without this stuff being added to BS. There’s a lot more to RTÉ than the bits you disagree with. Get’em, Catherine! Good jayzus, I hope her party will be able to field a decent amount of candidates next time out. She’s our Corbyn/Sanders. I don’t really have an opinion about you so I’m going to give you the benefit of the doubt and assume you’re taking the widdle there. You’re both completely wrong and welcome. 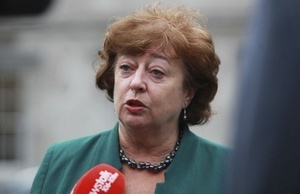 Well said, Catherine Murphy, the whole rotten situation set out clearly and succinctly – and we tolerate this? 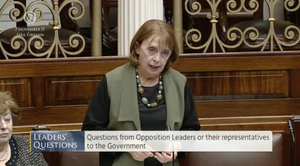 Without the left wing parties they are attempting to silence, we’d know nothing about the corruption among the highest levels in Gardaí with the treatment of whistle blowers, or the special deals with Dinny, and the Siteserv debacle. Sure it’s no wonder the two main parties who hardly differ at all would rather not have the inconvenience of ordinary people being made aware of shenanigans like these. since they prop them up.